MATTHEWS, N.C. (RNS) -- Seminaries have a reputation for being late adapters when it comes to modern technology. 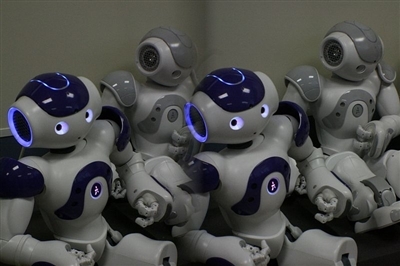 Photo from Wikimedia Commons shows a 2011 version of Nao robots introduced in France. The 22-year-old Christian apologetics school claims it’s the first in the world to use a robot to study the ethics of emerging technologies. The white robot with an orange cap from the French company Aldebaran Robotics stands 23 inches high and includes voice and facial recognition and full mobility. It translates text to speech in seven languages. The robot retails for $16,000, but Southern got an end-of-the-year deal at $9,300. Schools such as MIT, University of Tokyo, and Carnegie Mellon are experimenting with Nao robots as personal assistants. They can be used to feed pets, dance and help children with autism. For the last two weeks, Kevin Staley, associate professor of theology, said the robot has been residing at his home and frightening his cat as he tested its mobility and programming capabilities. “I want students to think about human-to-machine relationships, attachments we form that may cause us to dehumanize other human beings,” Staley said. As to whether Southern’s robot will get a biblical name, Staley said the school is hosting a contest to find the right name. For Southern Evangelical, incorporating a Nao robot in classes was about being on the cutting edge of ethical arguments, according to Richard Land, the school’s new president and former leader of the Southern Baptist Convention’s Ethics & Religious Liberty Commission. Staley said the Nao robot will open up conversations his students haven’t had access to before. It might even teach a portion of a class, especially since it can read articles from the Internet or email. * Copyright 2014 Religion News Service. All rights reserved. No part of this transmission may be reproduced without written permission.